Invisalign treatment is a proven braces method that offers precise tooth alignment with the comfort of removable braces. Sivley and Toogood, DDS is your Abilene Invisalign provider, helping teens and adults obtain straight, beautiful smiles. Our Abilene dental practice offers Invisalign clear braces to address mild to moderate alignment issues, such as crowding, uneven spacing, and minor bite issues. For custom Invisalign braces care, contact our practice today for a consultation. Invisalign allows individuals to make their smiles straighter and more attractive without the use of metal brackets or wires. These clear braces are made of acrylic and are nearly invisible when worn. Teens and adults can pursue work and activities without being self-conscious and trust that their teeth are being aligned in a discreet way. Since they are removable, you are free of diet restrictions and can enjoy eating as you normally would, allowing you to pursue daily life more freely. Oral care is easy, too, and you can pursue routine brushing and flossing habits, but you must clean the aligners as directed. Invisalign braces can correct teeth that have relapsed from their first braces treatment. If you stopped wearing your retainer, or if braces were taken off too soon, Invisalign® completes tooth alignment for long-lasting uniformity. Patients are required to wear a retainer after treatment, otherwise, the smile will shift again. Your Abilene dentists begin Invisalign treatment with a thorough examination of the smile. The clear braces are customized to every patient’s alignment needs with impressions. Invisalign labs fashion aligners based on your impressions, ensuring an alignment experience that is fully personalized. Treatment is advanced in steps: aligners are worn for about two weeks before patients move on. Regular appointments with Dr. Toogood ensures the treatment is effectively aligning your teeth. Throughout the whole process, your dentists tailor the aligners to better target your alignment needs. As long as patients wear Invisalign braces at least 22 hours a day, results should begin to show. Invisalign treatment benefits patients who have a variety of dental needs besides tooth alignment. 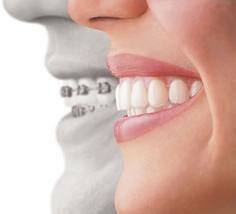 The clear braces can be paired with other treatments including dental implants and TMJ. Invisalign aligners will make more room for restored teeth, allowing for a uniform and full smile. If you have TMJ problems, Invisalign can correct the bite for a long-lasting solution, in combination with an oral appliance. For comprehensive oral health, Dr. Mark Sivley and Dr. Brian Toogood tailor Invisalign treatment to complement your other procedures. To see if Invisalign can benefit your smile, schedule an appointment with us today. Dr. Brian Toogood provides free Invisalign consultation to teens and adults from our practice off of Loop 322 and Industrial.